Need large chunky logs? Our special offer on beech logs are chunky for the larger than average wood burner / open fire. These are kiln dried beech 10 inch log length. They are chunky girth logs in girth for bigger stoves, overnight burning and open fires. 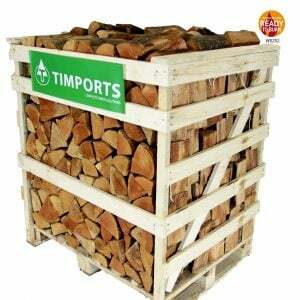 Large Chunky Beech Kiln Dried Logs, great quality, low moisture kiln dried firewood for the larger than average wood burning stove. Last year I ordered a half crate to try. I was so impressed by the quality and quantity of the wood for the price I paid and the service from both Timports and the delivery firm that I did not hesitate to order the larger crate this year. I ordered the chunky beech logs that are on special offer at the moment – I am blown away by how much wood is in the crate! Again, the customer service I received has been second to non – thank-you Ollie! Colin the driver from the delivery firm deserves a medal as the crate was too tall for the wagon they needed to use to get my wood to me due to restricted access instead of huffing and puffing as many wood he set about removing logs into a dumpy bag until the crate would go in the wagon and arrived here with a smile on his face and then had an awkward job trying to get the crate to where I needed it to go but he was determined he would do it and was so cheerful throughout! I really appreciated his can do attitude it was such a refreshing change! Thank you and well done Timports!